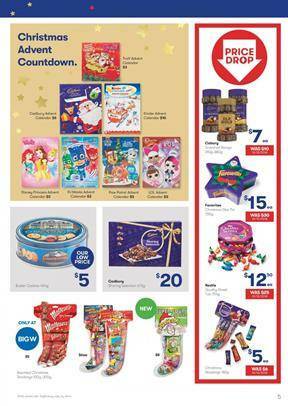 Start countdown in November with this special kind of gifts from Big W Christmas catalogue. Advent calendars are available on pg 5. Paw Patrol, LOL Surprise, PJ Maks, Disney Princess advent calendars are available on pg 5. Christmas cookies, candy tubs, and bags stockings with new products and exclusive items are also must-see deals by this catalogue. Buy gifts for him and her on pg 6-7. You have personal care products, beauty, and healthcare bags. These are eco packs that would cost lower than buying them as a single item. Skin care, creams, cosmetic bags on pg 8 were priced at 20-40% lower values. Sweet gifts like candies and chocolate boxes are also a part of the Christmas sale of Big W. Visit pg for products like Maltesers tub, Lindt Lindor chocolate gift boxes, M&M's, Cadbury Dairy milk and more. This is not the full list of gifts for Christmas on the latest Big W Catalogue. You can find many more things products from different categories of entertainment and essentials. They have an extensive sale this week.